Flowers are gorgeous creations of God that are guaranteed to elicit pleasure from you. Few can resist a smile when they look at a burst of vibrancy in the form of these delicate blossoms. Whether seen in a garden or a green house, wild outgrowth or tastefully done up in elaborate flower bouquets, all floral forms are widely appreciated by one and all especially women and children. Flowers are considered to be elegant and beautiful adornments and these are the most popular gift items to women on birthdays, anniversaries, other personal milestones and also the special events like engagements, weddings, funerals etc. When going to someone’s home for a visit, a bouquet of stunning flowers is a sure shot way to make a good impression. Red roses symbolize love, passion and beauty. These are most popular gifts to women. by loved ones and are very much in demand on days of love like Valentine’s Day etc. Poppies signify condolence and love and usually used to commemorate death and funerals. Daisies stand for innocence and find place in vibrant floral arrangements. Blooming lilies are generally used in burials as they symbolize resurrection. Carnations, calias, sunflowers, marigold, lotus, orchids and many more natural and also the horticultural developed flowers are commonly found at the local florist as well as online stores. These delicate flowers find place in several works of art and love poems and flower bouquets are amongst the most commonly gifted items worldwide. General gift item for signifying love, remembrance, good luck, congratulation, get well soon etc. Throughout history and across global civilization and diverse cultures, flowers have found prominent place as formal gifts and natural adornments. Ancient Dutch paintings show wonderful flower arrangements and symbolize the use of artistic floral bouquets in European culture and this was especially in the homes of aristocrats and well to do lifestyles. In Chinese culture floral symbolism has a different significance. White blossoms of plum indicate winters while spring is reflected by cherry and peach blossoms. Chrysanthemums stand for fall while lotus signifies bright summer season. In the Victorian era, Nosegay or commonly known as flower bouquet became a popular gift with young brides carrying small nosegay bouquets in weddings and later emerged as a fashionable accessory for stylish young women in the 19th century. Commonly exchanged between lovers and loved ones to show affection and fondness, flower bouquets can be simple collection of pretty flowers of similar or different types as well as be elaborately done up floral arrangements where different flowers are strategically positioned in an artistic manner for a breath-taking effect. Whether in a modern arrangement or in a cascading flower bouquet, fashioned in pomander or a nosegay, held by brides or a simple gift to a special someone, beautiful flowers are the perfect expression of love. 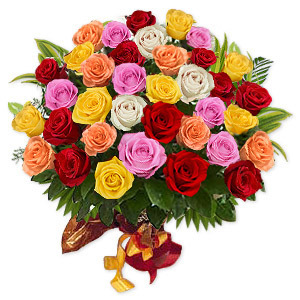 Surprise your loved ones with gorgeous flower bouquets and gifts on their birthdays by ordering flowers online. Not only for birthdays, even to propose someone special, this is best way to order flowers bouquets online and surprise them.